Ēriks Ešenvalds (b. 1977) is one the leading Latvian composers of vocal music and one of the leading Latvian composers of his generation. 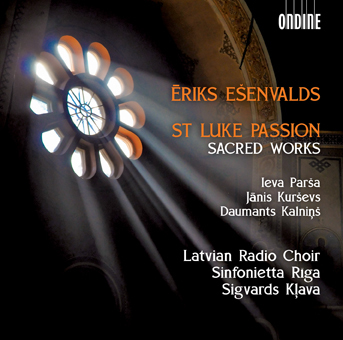 This recording features new works by the composer with the prestigious Latvian Radio Choir conducted by Sigvards Kļava. The title piece of the recording is a 30-minute Passion according to St Luke, a work in eight movements completed by the composer in 2014. The work holds a special place in the composer’s repertoire as the first Passion by the celebrated composer of several choral works. The music is sumptuous, rich, and powerful, with heroic, picturesque, passionate, and ethereal elements. A Drop in The Ocean (2006) is an impressive vocal work dedicated to Mother Teresa while The First Tears (2014) is based on an Inuit legend. Litany of the Heavens (2011) is a mysterious and magical work based on a religious poem by Fricis Bārda. Latvian Radio Choir’s previous releases on Ondine have been highly successful. For instance, the recording of Rachmaninov’s All-Night Vigil (ODE 1206-5) was chosen as the Record of the Month, Editor’s Choice and received a nomination in the Gramophone Awards in 2013. Also their most recent release of choral works by Valentin Silvestrov (ODE 1266-5) received Gramophone Editor’s Choice.